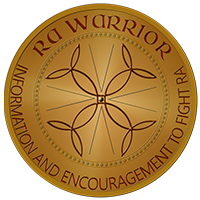 Disease awareness for “invisible illnesses” like rheumatoid disease (RD) can be pretty dismal. I’m the first to admit I had no idea what RD was when I was diagnosed. And, I’ve actually been stunned a few times by how little people with other invisible illnesses know about RD. “What?” I said, honestly, like I said, stunned. I don’t feel responsible for the look on my face at that moment. What crazy thing has someone said to you about your diagnosis? Most people just don’t know. Family members don’t know. People with other invisible illnesses don’t know. Healthcare workers don’t know. And we’ve all met doctors or nurses who don’t know. As a matter of fact, several doctors and nurses have become patients and shared in our community that they DID NOT KNOW. It’s just that simple: People don’t know. A bumper sticker is one way we can tell them. How many times I’ve heard people say: “There should be a bumper sticker”? Well now there is. Actually there are several. 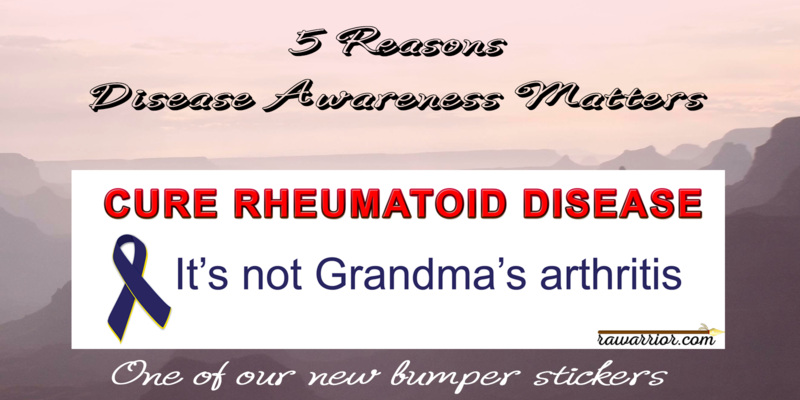 You can see the growing collection of disease awareness bumper stickers here. Think of the difference disease awareness has made for breast cancer and juvenile diabetes. Billions of dollars have been spent on developing better treatments while strides are made toward a cure. But money is not the only benefit. What did Helen Keller gain by traveling the world teaching about deafness and blindness? Awareness. 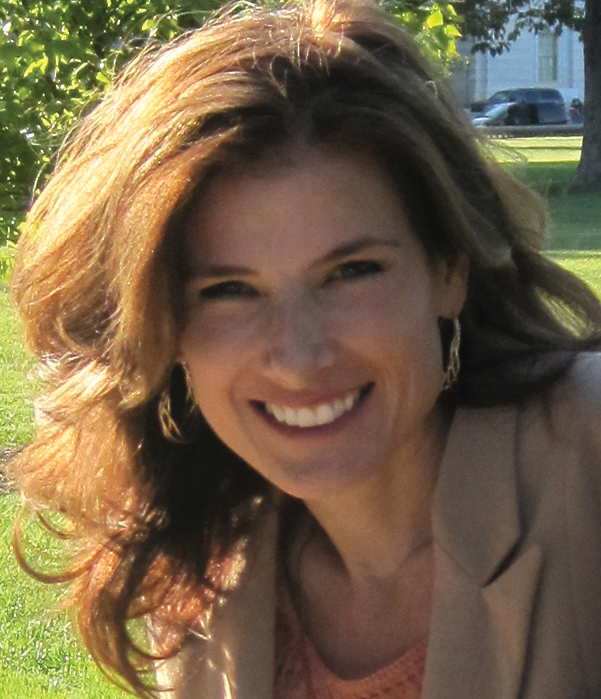 Her advocacy made many aware of the needs or concerns of people with disabilities. People just did not know. So she found ways to tell them. Can you think of more reasons disease awareness matters? What would you most like to see on an invisible illness bumper sticker? I have a growing list of ideas, and I’ll be glad to add yours. 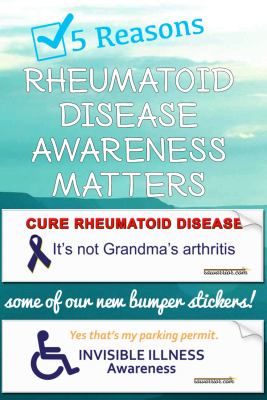 What Would Rheumatoid Awareness Mean to You? Hey Kelly, I’d love to see a bumper sticker that says “Invisible illness is real. Think before you judge.” And then maybe something about RD after that? When your whole body decides to destroy itself……And Does! Would love to see these available as a clingy that you put on the inside of the window. Kelly, can you help me out with more ideas? Flash mobs are “IN” and maybe we’d develop a better awareness in some people! I love this site. Kelly, your work is invaluable. As soon as the pins were available I ordered one and will now order the bumper sticker. I have learned so much from you. I was diagnosed with RD 3 years ago. My RD is responding to methotrexate and my activity level is low however this ride started with Grave’s Disease, then Grave’s Opthamology and most recently, fibromyalgia. I am wondering if this is a common occurance among people with RD? Love this so much! Thank you for writing. Often people misunderstand or underestimate the importance of awareness. I recently saw new rheumatologist after I found out I had a blood clot in my right lung and scarring in my left from “an inflammatory process”. Being 3 years into RA diagnosis, this was scary after everything else I have suffered with RA. I was stunned silent when the rheumy said to me “at least you aren’t in a wheelchair”. My aunt has severe RA with disfigured hands and 2 hip replacements. She still walks around but I can tell you she has suffered horribly. excellent comments Heather. Thanks for sharing. I thought I was alone in this disease. I’m so glad I started doing research and found this forum. I’m so tired of this disease being misunderstood. 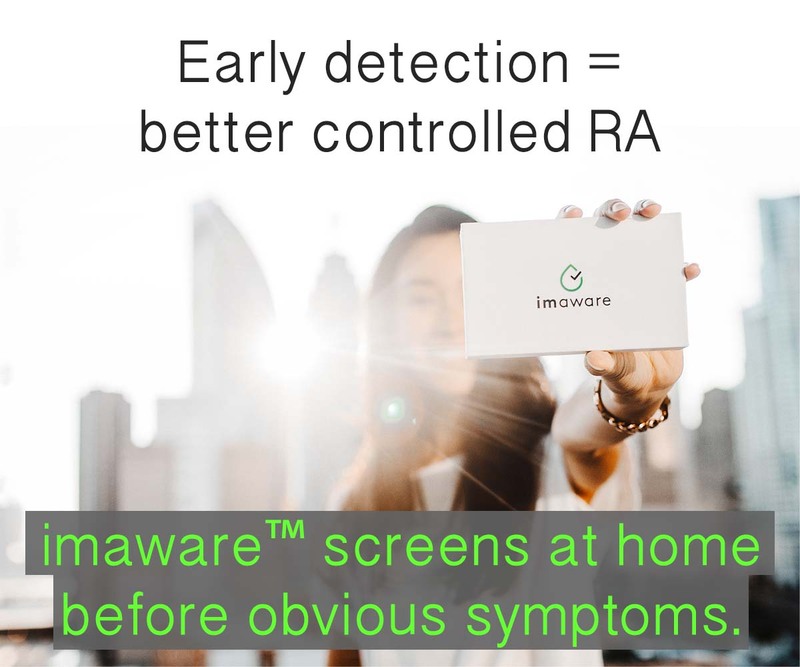 I’ve had a friend tell me before that RA is a fake disease. Yes, because when I was 17 I just decided to ‘fake’ having my joints attacked. I don’t miss skiing, biking, jogging, walking up stairs, kneeling down for more than 5 seconds, raising my arms above my head, etc at all. And lets not forget how much I love *insert sarcasm* taking all my medications. Last night I had a friend tell me that unlike my RA, her asthma is a real disease that requires doctors and medication. These are coming from my friends, people who should know me well enough to know that my symptoms, while invisible, are real if I say they’re real. When I try to explain the disease I can see their eyes roll and I end up sounding defensive or like a complainer. I also use sarcasm to deal with the constant insinuations that it’s a fake disease. I agree. Window clings would be great! T-shirts, too! Using the term “invisable” doesn’t help the cause. If it were used to describe Lupus or MS, there wouldn’t be as much awareness. invisable itself is made up, means it doesnt exist, but we know it does. We have to deal with our own bodies daily. Sometimes hour by hour, day by day or flares that can last for weeks and have to be taken to the ER. I prefer just saying internal RA or RD because that’s what it is. It’s very real. When I can’t walk, or get out of bed, or have parts of me swelling, those are visible. Not like a broken foot, or when I can’t hold a cup of coffee and it falls to the ground, I have constant fevers. People who are not supportive to the person who has RA or the better term RD thinks it’s all in the head. Invisable to them is laughable and not very credited. We have to have this for life, and it’s very real and will only get worse until there are better treatments or cures. We need all the help we can get. I want my life back. It’s been cruelly stolen from me. Thank you for all you do. I agree with others we need a clingy and a statement that paints a clear picture. RD it isn’t what you think! My daughter in law has this horrible disease…..she is so brave, but hurts all the time…..I want so badly something that will help her, and so far we haven’t found it. Thanks for this wonderful site! God Bless All. Like you, I am used to faking my RA pain. My meds seemed not working. I just pray and looking for miracle of overcoming this disease. I don’t complain anymore bcoz no one seemed to believe me. Thank you for the encouragement I get from reading this on Pinterest. This can be a lonely disease. I am now on my 11th year in this challenge. I do have a husband and daughter that are priceless to me. They help me all the time, I do not know how I would make it without them. I know the looks and people making comments that I exaggerate. The fatigue is worse now and the ability to stay on my feet a long time is getting more difficult . I used a wheelchair on a recent vacation just to be able to go see about a fourth of the sites. My family and I knew I would not be able to see everything, and prepared for that. My husband still had some depression from leaving me to rest. It is very humbling.